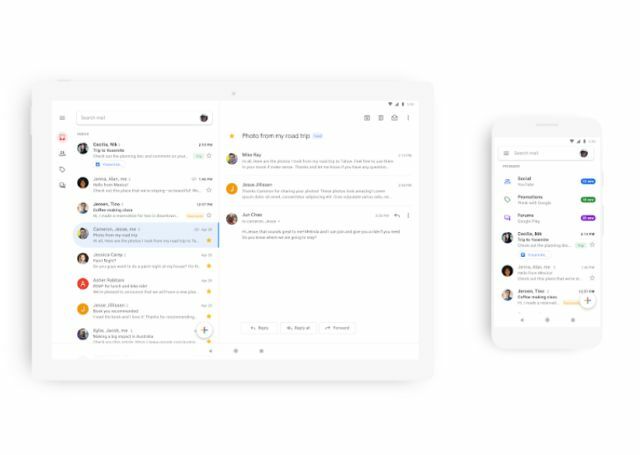 Gmail for Android and iOS smartphones has been revamped with Google’s Material Theme offering a more cleaner look for the app. Gmail users on smartphones will get some more features with this update as well. Google has been on a roll when it comes to updating some of its most popular services or applications and now, Google has introduced a revamped version of Gmail for Android and iOS with its own Material Theme. For the unknown, Google revealed the Material Design language, now known as the Material Theme, back in 2014 and since then, a number of Google apps and services have received this update. These include the likes of Tasks, Calendar, Photos, Gmail Web. Now the smartphone version of Gmail will be getting the same update which will bring new features such as shortcuts to attachments which will make you able to open the attachments without actually opening the email while you will also be able to able to switch between personal and work accounts more easily and quickly. Google has also added the “comfortable” and “compact” density options which automatically remove attachment previews and avatars, respectively. On the other hand, the whole user interface will be more bright and white. The search bar located at the top, which used to be red is now white, while the whole top section has been converted into the search bar. There’s also a shortcut on the main page right next to the account switcher while users earlier needed to open to the sidebar to switch accounts. The updated and revamped Gmail for Android app will be available for download starting today while iOS users will be getting the update in the coming weeks. With the app update, Gmail users will also start getting a red alert if an email seems suspicious and while this will be possible with the help of Google’s AI, overall, the new Gmail version has a cleaner look with a white background replacing the old red trim in most parts of the app. The new inbox section of the Gmail app also has links to social and promotions tabs situated at the top.